Need a good pick-me-up during a slow day at work? 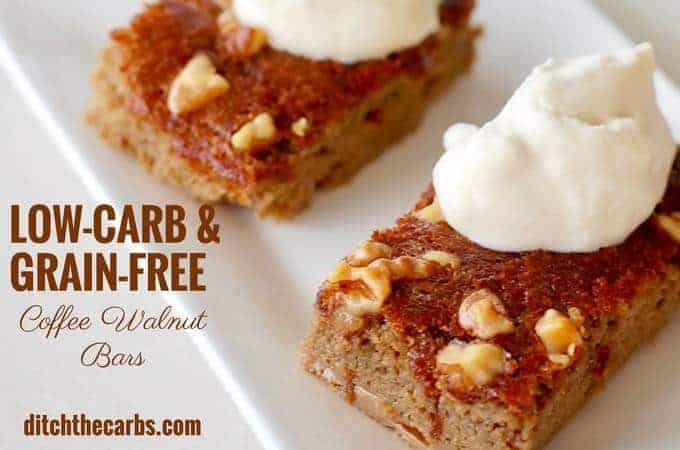 Pack some of these Low-Carb Grain-Free Coffee Walnut Bars. Healthy coffee walnut bars are great for snacking on when on a break or while reading a good book. Scroll down to see how I made this new sugar-free recipe that is perfect for coffee lovers. At only 1.5g net carbs, these are perfect to stay on track. This healthy sugar-free coffee cake is simply perfect for a work-place shared morning tea. Do your colleagues bring in sugary junk food that takes all your willpower to resist? Why not bring these instead. You could even serve them with whipped cream or chocolate cream? Coffee and walnut bars are sturdy enough to pack for lunch, a hike or a picnic. And sugar-free bars always make for a healthy mid-morning treat. Fuel Up with a Good Dose of Coffee – in a Bar! Regular energy bars at stores would have misleading labels and make you think you’re about to buy something that will help you get through your day. But when you read all the ingredients, you’ll find that they’re packed with sugar as well as oats and grains, and not to mention the unhealthy oils. Your blood sugars will be raised and you’ll get that afternoon slump about an hour later. Now that doesn’t sound healthy, does it? 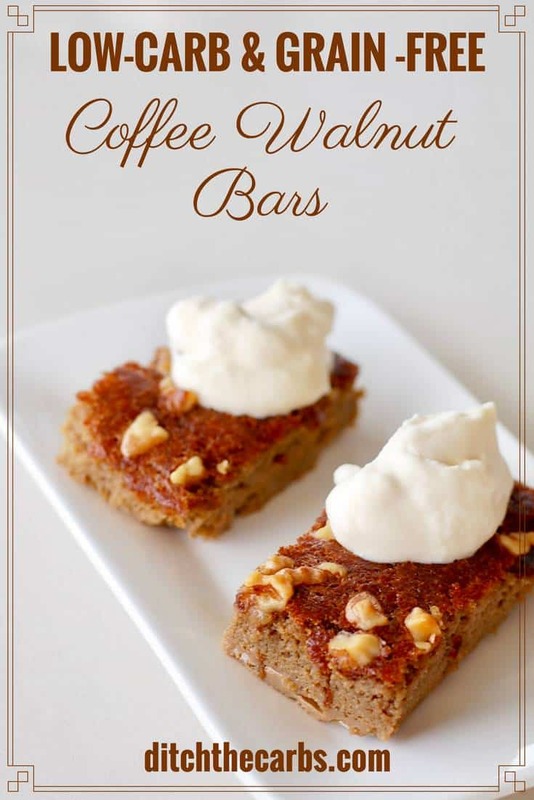 In this grain-free coffee walnut bar, it is sugar-free, grain-free and gluten-free. It is a wonderful way to enjoy your coffee fix! Forget the Store-Bought Bars – Make this Coffee Walnut Bar Instead! To have these on hand in the kitchen for your lunchboxes makes eating healthy convenient. They can be frozen in an airtight container for up to one month. Or why not make them as cupcakes? Easy and portable. It’s easy enough to buy a few of those nutri-bars but making them yourself is even better. No more of those carbs, grains and unhealthy oils – switch to this recipe and you’ll be glad you did. This is definitely a happy addition to my other bar recipes. Perk yourself up with a yummy Coffee Walnut Bar and share them with friends! Coffee and walnut bars are naturally gluten-free because they are made with coconut flour. 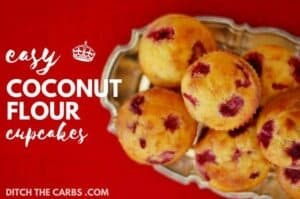 If you have never used coconut flour before, you need to read my Ultimate guide to Low-Carb Flours. I have a number of recipes now that I make with coconut flour. Take a look at my Coconut Flour Archives. 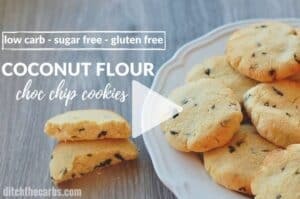 All the recipes in the archive, are either made with coconut flour, or have a conversion so you may use coconut flour as an alternative in the recipe. Whoah!! Low-Carb Grain-Free Coffee Walnut Bars . These are so yummy to enjoy with a good cup of coffee and whipped cream. In a large mixing bowl, mix the melted butter, the sweetener, vanilla together. Add the strong coffee, pinch of salt, baking powder and coconut flour. Mix gently. Slowly add 1 egg at a time, mixing after each addition until all the eggs are added. Pour into a baking dish lined with baking parchment, and cook at 180C/350F for 15 minutes, or until cooked in the centre. Allow to cool, slice into 14 bars and serve with whipped sweetened cream and a few extra walnuts for decoration (optional). Hi Libby- thanks for this recipe which I will be trying tomorrow. In the nutrition stats, you don’t list the fat grams. Do you happen to have that number, please? Thanks so much. My apologies, it has 11g fat. I have updated the nutrition panel. I have never tried but I am sure tye can be. I would freeze them sliced in an airtight container. I doubled the recipe and cooked it in a 9×13 pan. It took about 35 minutes. They turned out great! I thought it has more of a cake texture than a cookie texture. 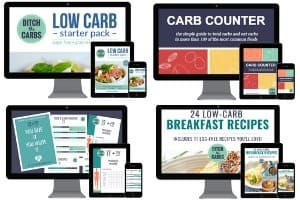 I brought these to school and they were a huge hit with everyone, even the non-low carb teachers. That’s brilliant!!! I love winning friends over with low-carb baking. Way to go! New to your site. Would like to make this recipe. What size pan did you bake it in. I need to know before I make it. Thanks for all your hard work! you will love it. So much cheaper, healthier, versatile and easy to work with. we use large eggs, what would the quantity be please and can this recipe be halved? I would estimate (guess) that you could use 6 large eggs instead. And yes you can halve the recipe, simply dial up how many servings you would like to make, and as if my magic, the ingredient quantities recalculate for you – yay! This may sound really silly, but what if I want to try this recipe… but I don’t like coffee? I know… GASP! Would they taste okay using just water, or would I need to use a little coffee to get the right flavor? 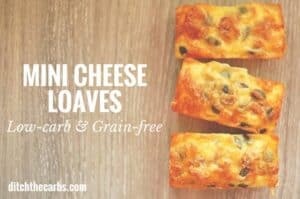 I like make-ahead, grab-and-go type snacks and this one sounded perfect for that (except for the coffee… LOL!). Thank you. If you didn’t add the coffee you would need to add some flavouring such as vanilla. But then the coconut flour: moisture ratio would be wonky. 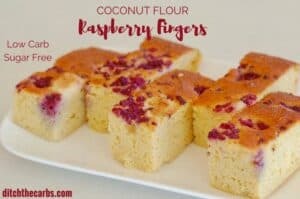 Why not try my other coconut flour sponge recipes instead. They are probably what you are after. Thank you so much! I’ll give those a try. Thank you Libby for this yummy recipe. I made these a few days ago and they are delicious! I used my Nespresso too. I had to leave them in the oven for an additional 15 minutes though, so 30 minutes total baking time. 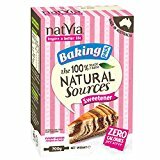 Could I substitute almond flour for coconut flour? I just made these and they are scrumptious ! As a type 2 diabetic on Keto these tasted like coffee shop specials ! I will freeze and bring out as needed for a gorgeous treat. They make me feel ‘normal’. How nice is that ! I was looking for that same bit of info. Me, too…what size dish, please, Libby? How about a vegan version? What can i use instead of eggs and butter? Oooh, you’ve thrown me a tricky one with this request! I’m afraid this recipe in particular won’t work =with so many substitutions because it is so heavy in eggs and butter. You’re asking for a completely different recipe. But what an awesome request. I’ll get my thinking cap on and see if I can come up with a vegan keto cake. Game on! Hey when you say “strong coffee” do you mean just the instant coffee grains…? Or is it a cup of coffee? Do I make a cup of coffee with the boiling water? Or is it just the instant coffee grains? You can use either. 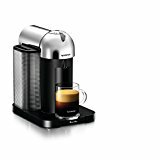 I generally use about 2 tbsp coffee in the hot water, or one strong espresso from my Nespresso machine. Go for it – you will know how strong you like the coffee taste. Some will like it subtle. Me? I like to knock my socks off with it. I am looking forward to try this recipe today. What size baking dish did you use? I thought I’d try this recipe today… How big is the baking dish you used? Made these today and thoroughly enjoyed them … thanks Libby. Made these the minute we saw the post. Using your ingredients – the mixture seemed a bit runny – and we only used four (large) eggs. Is it supposed to be extra runny like that? So we compensated by adding a little extra coconut flour. The final product tasted okay, but a bit “spongy.” Would more eggs have helped? Still can’t quite crack the coconut flour recipes to our liking. May consider adding some vital wheat gluten to give it some buoyancy. And I wonder if some whipped egg whites would help too? Either way – love these recipes regardless! I wonder if you have the correct coconut flour? Some coconut flours aren’t “defatted” (and so won’t absorb as much liquid as true coconut flours do) but are more of a ground desiccated/shredded coconut mix which doesn’t behave in the same fashion. I am so glad you enjoyed it anyway and are persevering with coconut flour. Once you find a brand you love, stick with it and you will love it. So much cheaper, healthier, versatile and easy to work with. I used Jan’s Organic Coconut Flour. Very fine powder. I also have used Bob’s Red Mill in the past. Another note – we used Skinny Girl Stevia packets for the sweetening. Left a funny taste in our mouth. It was old, however, that may have contributed. Having sweet things is a tricky endeavor. I think I’ll stick with just the natural sweetness from fruits such as blueberries, etc. in the future.